What is Square Root of a Number? How to Calculate Square Root in Excel? 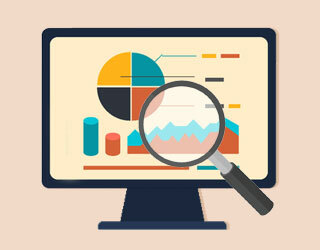 There is a bit list of formulas in excel. 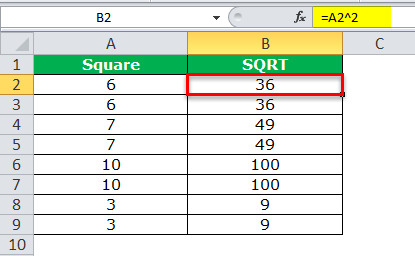 SQRT in excel is one of the many MATH & TRIGNOMETRY function in excel. The square root of a number that we get if we multiply the number with the same number itself. For example, The square of a number 25 is 5, because if we multiply the number with 5 with 5 we will get a value of 25. We can also write the equation this way as well. 5 * 5 = 25. Square root works for negative numbers as well. Now, look at the below examples. If the number -6 is squared we will get a positive number of 36. -6 * -6 = +36. As per the mathematics rule if we multiply the negative sign with the negative sign we will get positive number. And off course 6 * 6 = 36 also. So the square root of 36 is either 6 or -6. The Formula of Square Root in Excel is very simple. It includes only one parameter. Number: This is the only parameter SQRT excel function has. We need to supply the number that we are trying to find the square root value. One important thing we need remembers here. 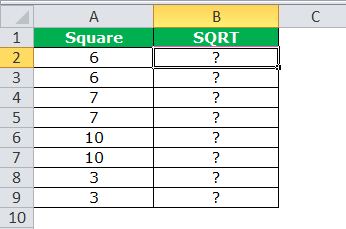 Square root formula in excel can return the result only for positive numbers. If we supply the negative number we will get #NUM! Error. 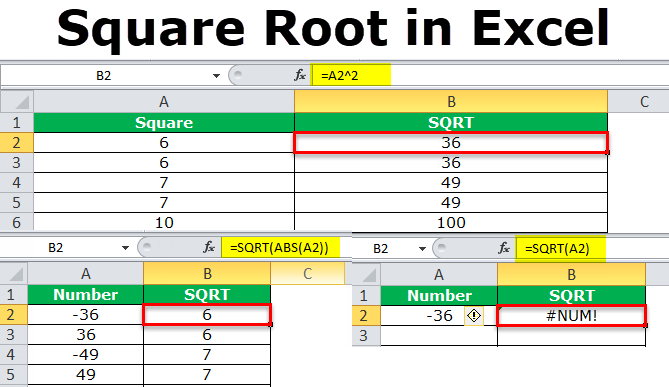 How to Calculate Square Root (SQRT) in Excel? 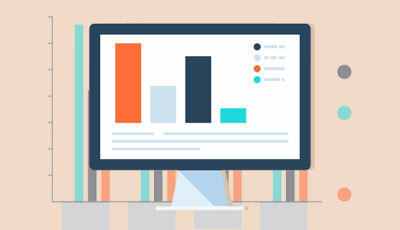 In excel we can calculate the square root in excel not only by using the square root but we have several other ways to calculate the square root value. I have a list of numbers. We need to find the square root value. Copy this numbers to excel. Open the formula in B2 cell. Now select the required cell i.e. A2 in this case. 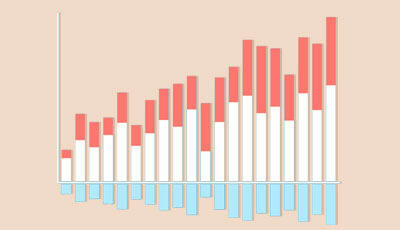 Now drag and drop the formula to remaining cells. In the earlier section of this article, I have mentioned that square root in excel formula can work only for positive numbers. If we supply the negative number we will get #NUM! Error. 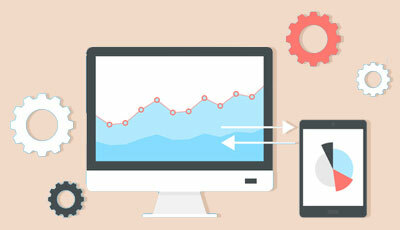 But we can apply another formula with SQRT function excel to get this done. Now, look at the below negative numbers. 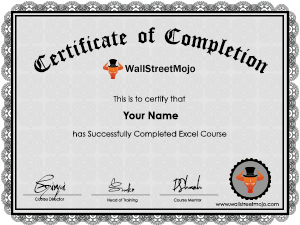 I have applied the SQRT Excel Function at this point in time and I got #NUM! Errors due to negative numbers. To solve this issue firstly we need to convert all the negative numbers into positive ones. So I am going to use ABS function which can return the absolute value of a negative number. 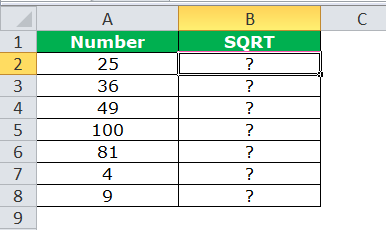 We need not apply this formula separately rather we can nest this formula inside the SQRT excel function itself. 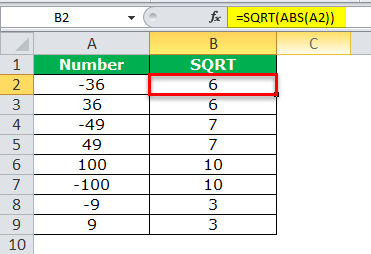 Firstly ABS function will convert the negative number to positive number and SQRT excel function will work fine because of positive number supplied by the ABS function. We have learned how to calculate the square root number in excel formula. But we can find the square of the number too. Now, look at the below numbers. If I multiply the 6 with 6 I will get 36 as the result i.e. the square root of a number 36 is 6. 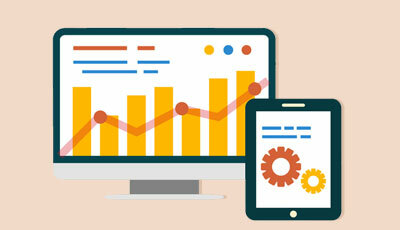 But we don’t have any special formula to calculate the square value but still, we can do this and that is the power of Excel. By using exponential symbol we can solve this problem. 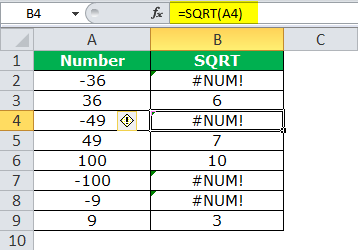 SQRT function in excel an accepts only positive numbers. 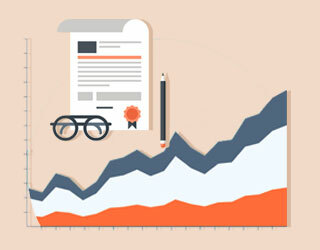 If you supply negative numbers it will return the result as #NUM! In order to insert square root symbol hold the ALT key and type 251 from number keypad.